A number of people have asked about my Nexus One - did I like it, should they get one, any tips... figured it was a good time to jot down some thoughts. Big, honkin' disclosure: I received this phone for free, and I work for Google. Bit of background: as is now well known, Google gave all employees a Nexus One ahead of the holidays. The phone's existence was confidential at the time, so we were asked to not blog or tweet about it. Officially, the phone was announced on January 5, and has been available for sale through the Google website from that day forward. I use two Gmail accounts: one for corporate mail, one for personal mail. The Gmail app on the Nexus One supports multiple Gmail accounts out of the box, so I get a superior mail experience right away: on the iPhone, I used the browser interface for both accounts: the iPhone mail app doesn't support Gmail's "conversation card" view (grouping threads together), Gmail's archive feature, or Gmail's search across the entire account - all things I rely on in Gmail. From an e-mail perspective, the Nexus One fits my use far better. Next up: Google Voice. Conveniently enough, around the same time Google acquired FeedBurner, we also acquired Google Voice. As a result, the only phone number I've given out - in e-mail signatures, on business cards - is my Google Voice number. There is no Google Voice app for the iPhone, so my GV experience on the iPhone was never very good: calls to my Google Voice number worked just fine, but calls from the iPhone always showed my AT&T phone number. On the Nexus One, all it took was logging into Google Voice - a couple steps later, my phone new to route all incoming and outgoing calls through Google Voice, so that the only number anyone ever sees from my phone is my GV number. The phone's four dedicated buttons took a bit of getting used to, but after a month of use I'm squarely in the camp who find them to be an excellent step up for phone navigation. Hold down the Home button and you get a menu of the most recently used apps - making navigation between apps a breeze. Think of it like alt+tab for your mobile phone, something that exists on the Blackberry but not on the iPhone (which doesn't allow multiple apps to run at once. Even better, with Android supporting apps running in the background, you're taken to where you left off in the app when you select it. The universal "back" button - which goes back to whatever you were doing previously, whether that was a prior webpage, or a different app - is awesome (once you get used to it). Contact sync is phenomenal: you can sync as many contact sources as you want (I'm syncing three contact sources: corporate Gmail, personal Gmail, and Facebook); the phone then does an on-device "merge" to display a de-duped view of the contact. (It's not a true merge - Facebook data is read-only, so Android can't modify that info.) And anywhere on the phone you see a contact's name, you get the ability to pull up a short-cut menu that lets you dial, IM, SMS, or e-mail them - pretty slick. Changes you make to your Gmail contacts are immediately synced back to the cloud, no need to plug the phone into your computer. Much has been made of the menu button (and, to a somewhat lesser extent, Android's use of the long press). I love the menu button - I've seen others refer to it as the "right click" of the mobile OS, and that strikes me as a pretty apt analogy. I like getting under the hood - and Android makes both the OS as well as its apps incredibly useful to people who like to tinker. The downside for some - not me but I understand the complaint - is that it hides sometimes critical app settings/options, making it harder to discover and potentially a barrier to use. The long press is trickier: there's really no way to know what's going to react to a long press, but it's often an invaluable extension of the app. Once you know that a long press is possible, it often simplifies actions (adding bookmarks, quick-dialing numbers, editing info, etc.) that might otherwise take a few clicks. Google Maps, especially the turn-by-turn navigation that first launched on the Droid is a dramatic upgrade. More layers (terrain, streetview, Latitude are just a few I use daily) make the maps much more interactive on the Nexus One, and the navigation - the phone speaks each turn to you, and as you near arrival, you see the streetview image of your destination - is just perfectly executed. One last comment before talking about the third party apps: speech recognition. I had the phone for weeks before I realized how compelling this feature was: anywhere you can enter text, you can speak to the phone. The voice recognition takes your words, uploads them to the cloud where Google servers translate that to text, then send it back down to the device. It's not perfect, but the other day in the car I was able to dictate messages in an IM conversation and the person on the other end had no idea I wasn't actually typing. It's incredible the first time you use it - and it's available in any app (I've also spoken to the Seesmic app, which then posted the tweet as text to Twitter, and to the Gmail app in responding to e-mails). And the voice quality? Thanks to the phone's processor and a second, noise cancelling mic on the back of the phone, the voice quality on phone calls is superb. Aldiko: outstanding e-book reader (better than Kindle on the iPhone in terms of feature set; obviously the book store is not quite as good, but the integration with free eBook download sites is a plus). Currently reading Makers by Cory Doctorow. Amazon: search the full Amazon catalog (can use barcodes or photos in addition to typing or speaking your query), track orders in my account. AppReferer: builds a QR code (a 2D barcode) that makes recommending an app to another Android user in person a one-click affair. Battery Graph: shows a nice chart (exportable, even) of battery usage, which is helpful if you're trying to isolate when the battery started to drain. Congress: built by Sunlight Labs, a phenomenal "pocket Congressional directory" that includes contact info, committee memberships, news, and YouTube vids of every Senator and Representative. DroidLive Lite: Streaming radio (via Shoutcast) from 1300 radio stations around the world. Fandango: Order movie tickets from movie theaters so I can bypass lines at the ticket counter. Gmote: turns my Nexus One into a touchpad remote (when paired with a computer running the Gmote server software). Handy for giving presentations, or just doing something nerdy and cool. Google Goggles: search Google by taking pictures. Google Sky Map: the one app that consistently blows people away. Load it up, turn your camera toward the night sky and you'll get a real-time view of which stars, constellations and planets are above you. An awesome accompaniment to a telescope. Layar: Augmented reality app that displays info on screen in realtime through your phone's camera. My Tracks: built by some Googlers, great app for keeping track of runs/bikes/ski runs you've done; captures altitude, distance, etc., then uploads to Google Maps My Maps. OpenTable: make restaurant reservations from the phone. PapiJump: great little game using the phone's accelerometer. Pintail: monitors your phone's SMS messages for a message that says "locate" (plus a PIN); once received, activates the GPS and replies with the phone's location. Helpful if you've got a lost phone. Scoreboard: Tracks scores of your favorite teams, with realtime updates and notifications as score changes. Shop Savvy: grab a barcode, find out who sells it and for how much. TiVo Remote: works with any TiVo HD unit over WiFi. TripIt: phenomenal itinerary manager for all travel info. Voice Recorder: does exactly what it says it does. The battery life lasts the day, but barely. I had a few problems with the battery not lasting the full day, and through a combination of Battery Graph (mentioned above), Android's built-in Battery Use (under Settings | About this phone | Battery use - it shows which services used the battery, along with more data about the specific power consumption) and input from fellow Googlers, I was able to pretty dramatically improve things. Keys were ensuring that sync was working properly (a Facebook sync error was causing perpetual sync attempts, which was wasting battery life) and keeping the WiFi radio on (which prevents the phone from constantly defaulting to the more resource-intensive cellular radio for data). Screen: the screen is gorgeous (really: it's kind of amazing), so long as you're not in direct sunlight. I'm not outdoors all day long, so this doesn't significantly impact me... but it's an issue for some, I'm sure. Bottom line: love this phone. What am I leaving out? What else do you want to know about it? One thing you may not know about Gmote is that you can also use it to stream music from your home computer *to your phone*. You'll only want to do that with 3G or WiFi though. You'll also need a steady hostname and a port open on your router, like you need to do to do anything to your computer from afar. In Gmote, while in the file browser, switch the radio button at the top of the screen to reverse the direction of the stream. Nice review, I was curious what your thoughts were since you have blogged and tweeted about various iPhone apps in the past. I was very pleased to see you mention Locale. This, in my opinion, is a premier app for Android and is often overlooked by Android review sites. After waiting in line to get a G1 on launch day, this was one of the first apps I downloaded, and the first app I reinstalled when I picked up a MyTouch. Now that it is out of beta, it is absolutely worth it's new cost. Have you seen or tried the "Blogaway" app? I would really be interested in your thoughts on the only Blogger app for Android that I have kept on my phone for more than 5 minutes. Haven't tried Blogaway, will check it out. Awesome. It's like the one thing missing from Android for me. Rick - do you happen to know anyone on the Android team who might be able to help us get some Hawaiian characters added to the keyboard? I've been digging and no one has been able to help. I've worked with Apple (getting the characters added to iPhone and iPod touch) and Google (localized the search engine into Hawaiian through the GIL program). Here's an example of how it works on the iPhone. I understand on Android the diacritics are done the same way - a pop-up when you hold a finger over the vowel for a bit. Any help in contacting the appropriate people would be greatly appreciated by us advocates of Polynesian languages - most of which use the macron on all vowels, upper and lower case, and the glottal. Checking with the team, will follow up once I have the right person. Thanks for the info, interesting you got better battery life using wifi. That's the reverse of the iPhone experience. Great review Rick. 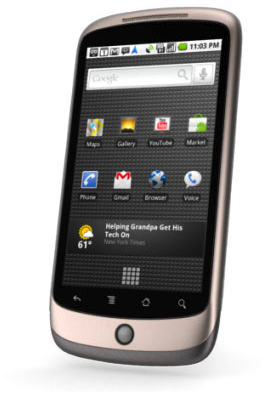 I'm hoping to switch to an Android phone when my current Verizon contract runs out. I'm glad to hear that you're working on a Blogger app. The only way I can view Blogger blogs on my current LG enV2 phone is by logging on to the mobile version of Google Reader. It works well, and it's a lot better than nothing, but I'm looking foward to getting a better phone. I wonder if the support from google on the phone will be on a par with the support they now offer for feedburner - where the *only* support channel is a set of google groups, filled with questions from people with problems and no answers from google for weeks and possibly months. Thank you for these thoughts. I've been progressing towards this phone since mid January. I only recently happened upon your blog entry here. Q: At Google, what is the preferred keyboard app? Q: Now that its March, which app has made it to Wow! at Google? Q: Which app is the most practical in terms of every day use? Q: Is Google Voice a total reality on the Nexus One or are there things which don't work yet as planned? IE: Since I bought the phone outright, using Google Voice, can I get by with the smallest minute plan on my carrier and talk all I want? Great post and thanks for the heads up on Locale. I'm eagerly awaiting my delivery right now.. the N1 is somewhere near Cincinnati. I just hope the DHL guys keep their paws off it- a big problem, from what I've read recently! Try our Pixelpipe, it allows me to post photos and videos to numerous sharing sites such as Flickr (even to specific sets), YouTube etc. Works extremely well despite the negative reviews in App Market. I use the paid version that has a slight bit of additional functionality. Looking forward to trying some of the other apps you suggest. Just a FYI: The screen can break pretty easily. Unfortunately we found out the hard way and it's expensive to replace (around $250). FreedomTM - last chance to pre-order!